World Heroes © 1992 Alpha Denshi Company, Limited. 8 heroes from different time periods compete to thwart Geegus, the evil alien end boss! Includes an extremely fun and unique death match mode! World Heroes was released on July 28, 1992. It is Alpha Denshi's first game in the fighting game genre. 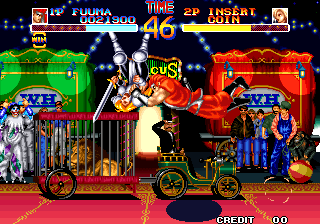 It was even the last game with the Alpha logo labeled within the game before the developer became ADK; however, the Alpha logo was last used on one of the arcade flyers of its sequel. Due to the game's success in the fighting game market, the game was followed by a sequel, World Heroes 2, less than a year later. The popular "Death Match" mode (removed from World Heroes 2 Jet and World Heroes Perfect) may have been inspired by the growing popularity of deathmatch style pro-wrestling in Japan at the time which was mostly made famous by Frontier Martial-Arts Wrestling. Hanzo is based on the real Hanzo Hattori Musashige (just like Hanzo in "Samurai Shodown"). Fuuma is based on the real Kotaro Fuuma Nobuyuki (1581-1603). Kim Dragon is Alpha Denshi's homage to Bruce Lee (1940-1973). Janne is based on the real Jeanne d'Arc who was burned in 1431. Rasputin is based on the real Gregoriy Yefimovich Rasputin (1869-1917). Brocken is loosely based on Rudolph von Stroheim from JoJo's Bizarre Adventure. Muscle Power is most likely based on the real Hulk Hogan (1953-20XX). J. Carn is based on the real Genghis Khan (1162-1229). The first World Heroes game is also the only game in the series where Kim Dragon is Chinese. He was then changed into a South Korean character for the rest of the World Heroes series. The name of the Scientist who invents the time machine in the intro is Dr. Brown which might have been inspired by the character Dr. Emmett L. Brown (a.k.a. Doc) from the Back To The Future movies. [JP] SNK Neo-Geo AES Sep. 11, 1992 "World Heroes [Model NGH-053]"
[JP] Nintendo Super Famicom 1993 "World Heroes [Model SHVC-WZ]"
[JP] SNK Neo-Geo CD 1995 "World Heroes [Model ADCD-005]"
[JP] Sony PS2 2007 "World Heroes Gorgeous [Model SLPS-25782]"
Sony PlayStation 2 2008 "World Heroes Anthology"
[JP] Sony PS2 2009 "World Heroes Gorgeous [NeoGeo Online Collection The Best] [Model SLPS-25933]"